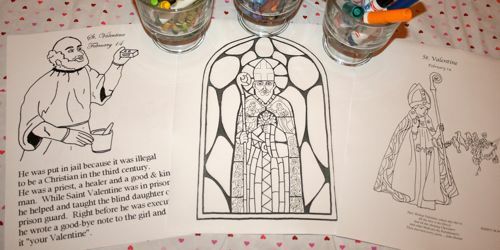 I wasn't having much luck finding St. Valentine (emphasis on Saint) printables that I was interested in using today, so I ended up making a couple of my own. Drawing from the picture book Saint Valentine by Robert Sabuda, and adapting some of the vocabulary and discussion questions to go along with it (found in Catholic Mosaic ), I created a Word Search and Crossword Puzzle for my children to complete after we read the book. And don't forget the beautiful picture of St. Valentine in Fenestrae Fidei ! I just finished printing off some!! Happy Valentine's Day! Thanks for sharing! Did you find a site online to do these or did you create them on your own somehow??? thanks! they will be our post dinner acitvities. Kelly ~ It was sort of a mix. :) I used a couple different free online sites to create the actual puzzle and word search, cropped them and then used a word publishing document to add the header (and all the other text) on each page since I didn't like how it was formatted.